You are here: Home Forum Home Glasspar G3 1960 Center Deck Ski Boat. 1960 Center Deck Ski Boat. 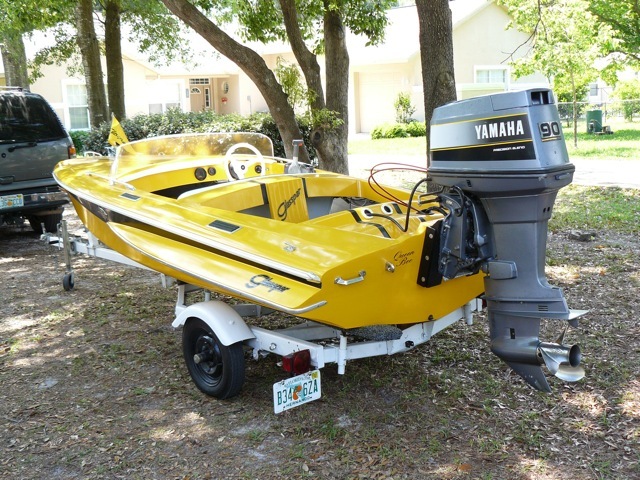 TOPIC:	1960 Center Deck Ski Boat. A week ago I had a mystery find on my hands. Under a pile of brush and poorly tarped for at least the last 20 years my friend and I found a boat on a trailer. It was covered in moss and filled with leaves but I could tell it had beautiful lines and was something special under all that garbage. Since my friend Steve hadn't remembered my birthday I jokingly asked if I could have the boat. He said it had belonged to a friend of his father's who passed away and had no family so he said okay, happy birthday ! She's a mess but so pretty I couldn't let her die. She's home now and come spring the pain begins. The floor is gone, the stringers are mush, and although the transom seems to have been rebuilt at one time or another ( it's one piece with no separation )I'm going to redo it anyway as I plan to hang a 100 HP motor with trim/tilt on her so I can really enjoy what so many of you say is a great hull. I'm a computer bonehead and still haven't figured out how to make my pictures smaller but when I start in the spring I'll get a newer camera so I can record the whole thing and post pictures. I can't wait to get her wet. !! LOL. Merry Christmas all. I'll be back. G3 Owners Association has some good technical drawings on its homepage for things like the transom radius and seat construction. I take my pics on the lowest res setting and usually have no problem and sharp pics, plus saves memory. When it comes to motors, was there ever a factory deal with a manufacturer or did the G-3 come with the motor of your choice ? I'd like to rebuild correct if there is a brand association with Glaspar. New G-3s came sold with motor of choice. Many had Mercs, Scotts, OMCs etc. I bought my first one new in 1960 and put a Johnson on it. You just need to find a vintage engine of that era that runs and looks nice and put on your G-3!! A G-3 looks great with all motors!!! The Flying Scotts looked cool on them, as did the early white and silver Mercs Here is pic of a friends G-3, restored, with a nice Yahama on it!! Well I've got a 61 40 HP but that's not going to do it for this boat. I love those white and silver Mercs but you don't see them up here north of the border. I haven't seen one in 20 years. That's absolutely beautiful by the way ! Here's a picture, there's more in Member Projects. Sorry it took so long but I'm practically a Luddite. Too hot for powerwashing today but it had to be done. Here's a couple "before and after" shots. At least now I can see what I have to work with. It's not much. lol. And under that white and brown paint with 30 years of crud was a cream and cherry hull with pink noslip on the deck and a pink interior. Wow. I think they sliced off the old transom. And bonded over the rear seam. To add insult to injury whoever put the last floor and stringers in didn't even glass the stringers. They laid plain 2X4 down and sistered them to the already rotten ones ! That's just lazy. Is there a limit on thread size? It looks like you are finally getting started on your G-3. You asked about posting photos here on FG. I have a digital "Nikon" D90 and on my pictures I reduce them 20% and they seem to post alright here. For more info on the restoration of your G-3 you can also go to this website: www.g3owners.com . I thought you might like to read through a thread on the "refurbish"
of our one-family owned 1960 G-3 which I posted on another website. Maybe you can pick up some ideas from what I did, although our G-3 was very well taken care of throughout it's life. I'll take all the help I can get. This ones been restored before but very roughly. I'm going to have to start from scratch with most of it. I don't know why those pictures didn't load, the rest of them did and they were all from the same camera. I went back and checked many of my pictures that I have uploaded here on FG and found that most of the pictures were reduced from my "Nikon D90" down to a size of 858X570. I hope that helps you some Sir. I thank you Sir. I actually had to go to a camera shop and have the resident geek set it up for me. The problem is weird, my pictures are about 615 and won't go smaller but some work and some don't. I'll adapt. LOL. I'll be blasting through her again tomorrow as I want her stripped down to the buff before I start grinding and sanding. I've got a ton of cleaning to do before I even think of starting all the repairs. There's a few more pictures of her in the Members Projects thread. The ones that wouldn't load here worked there. Go figure. Have a great day. Since I've got the Humber about 90 % ready to go I'm going to pull out the G-3 again and finish removing the crud and get the interior down to the original fiberglass. I've got my multi tool ( God's gift) and my old grinder and we are going to do some serious damage this week. I don't know how but I'm going to try and do this right so I'll figure out way to split the hulls where they have been filled or glassed over on the transom. I know this will be worth it. I've seen what you fellows have done ! There's no rush so I have the luxury of doing it right if I can. I do something much simpler. There is a photo editor that comes with the Microsoft Office Suite. It has an option to reducing a photo's size for emailing or posting to a website. It will reduce a 780+KB file to 36KB or there abouts. Just remember to save the reduced file under a different name or you will replace the original with the smaller and you can't reverse the process.